Biggest Food Database — 6+ million foods in our database including global items and cuisines. Barcode Scanner — Simply scan barcodes to log foods. 4+ million barcodes recognized. Recipe Importer — Easily import the nutrition information for the recipes you cook. Restaurant Logging — Quickly log menu items from your favorite restaurants. Food Insights — Learn how to make healthier choices about the foods you eat. Personalized Experience — Create your own foods, recipes, and meals and save favorites. 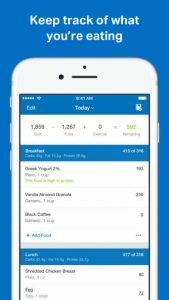 Calorie Counter — We automatically calculate the calories in your foods, meals and recipes. Track All Nutrients — Calories, fat, protein, carbs, sugar, fiber, cholesterol, vitamins, and more. Customize Your Diary — Log breakfast, lunch, dinner and snacks or create your own meals. Water Tracking — Log water in cups, ounces or ml. We save your recently logged amounts. Choose A Goal — We support weight loss, weight gain, and weight maintenance goals. Goal Setting — Create your own goals or let us create personalized goals for you. Change Habits — It’s almost like having a nutrition coach right inside your pocket. Connect 50+ Apps & Devices — Syncing your workouts is easy and automatic. Choose From 350+ Exercises — Or create your own exercises and workouts. Log Cardio Exercises — Including running, walking, biking, swimming, yoga, pilates and more. Log Strength Exercises — Including sets, reps, and weight per set. Track Steps — Set a daily step goal and see a graph of your step history. We connect with all your favorite apps and devices — Including Fitbit, Jawbone UP, Garmin, MapMyFitness, Runkeeper, Strava, Runtastic, Misfit, Withings, HealthKit, UA Record and many more! Add Friends — Connect with friends for an extra layer of support and accountability. Join Our Community — Find motivation, support, tips, and advice in our active forums. Newsfeed Updates — Share your accomplishments and see friend’s progress in the news feed. Chart Your Progress — Stay motivated with a graph of how you’re improving over time. Progress Photos — Add photos to your weight entries to see and celebrate your progress. Nutrition Reports — View a history of your calories, macros, and nutrient intake. Share Your Progress — Help inspire friends and family members on their own health journey.